Though only a short distance from the bustle of Stanstead Airport, the ancient church of St Mary's at Stansted Mountfitchet stands in an isolated position near Stansted Hall and well away from the village it was built to serve. The bulk of the church is of 12th-century date. A pair of doorways in the nave date from about 1120, as does the chancel arch. In the following century the chancel was extended and a north chapel added, possibly by Roger de Lancaster, of Stansted Hall. Thus the church remained virtually unaltered until 1692 when a west tower was constructed of brick. It seems very likely that the builder of the church was William Greno, the Norman lord responsible for building the nearby castle at Stansted. The best features of St Mary's - apart from the 12th-century doorways - are the tombs. There is a late 13th or early 14th-century effigy of a knight in full armour which is thought to be either Sir Roger of Lancaster de Rydal, Lord of Stansted Hall from 1285-1291, or his son, Sir John of Lancaster, who died in 1334. There are also a pair of 17th-century tombs to members of the Middleton family. The oldest is that of Sir Thomas Midleton, the other to his daughter, Hester Salusbury. Both tombs have life-sized effigies of the deceased in wonderful period costume. There is also a 14th-century memorial brass with an inscription commemorating Robert of Bocking, the first Vicar, who died in 1361. Also of note is an ancient font dating to around 1200. A small section of 14th-century wall paintings were uncovered during a Victorian restoration. 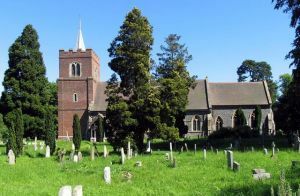 St Mary's is no longer used for regular worship and is in the care of the Churches Conservation Trust.